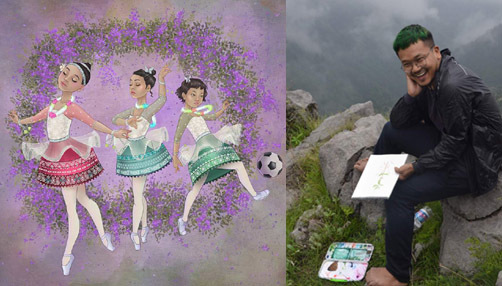 ‘Little Indian Ballerinas’ an art work by Thokchom Sony, (right) where three little girls prance across the canvas in tutus with traditional Manipuri motifs. With his paintings, Manipuri artist Thokchom Sony has defied the conventional style of art. From trendy phaneks that “anyone can wear” to brides who are “too loud” are the examples which have drawn attention of all. He has been able to present Manipur on the canvas in an artistic way. Through his ‘Wedding of my BFF’, artist Thokchom Sony has depicted a Manipuri bride and her two friends. The artist received some criticism as the bride seemed ‘too loud’ and not ‘demure enough’, reports Indian Express. Phanek is a traditional loin cloth worn by women in Manipur, especially of the Meitei community. It is wrapped around like a sarong — an item of daily clothing for the older generation, but relegated to “special occasions” for younger women. In the painting by Sony, two young Manipuri women — one with rigid curls, the other with poker straight hair — are wearing this seemingly complicated attire with envious aplomb. The phaneks are draped around their jackets. The subjects in Tea Break are products of a cosmopolitan society — strong, independent women, exactly the kind Sony likes creating through his art, says the report. In Sony’sLittle Indian Ballerinas, 3 little girls prance across the canvas in tutus with traditional Manipuri motifs, and in Shoot Love No Bullets, a woman totes a gun that isn’t shooting bullets but a shower of wildflowers. The artist started painting professionally in 2015. Thokchom Sony is a faculty member at the Jamia Millia Islamia and is now showing his works — along with another Manipuri artist Meena Laishram — in an ongoing exhibition “Khongool” (meaning ‘footprints’ in Meitei) at Gallery Onkaf in New Delhi.